NIA CHARLESTOWN NEVIS (December 19, 2014) — The Nevis Island Administration’s (NIA) 2015 Budget received safe passage at the Nevis Island Assembly on December 18, 2014. The $165 million Budget was passed unanimously on the final day of the sitting following its commencement on December 16, 2014. During the Budget presentation, Premier of Nevis and Minister of Finance Hon. Vance Amory spoke of the status of the Administration’s public debt, an important aspect of debt management. “Mr. President, as at September 30, 2014, the total overall debt of this Administration stood at $352.80 million, a slight increase of 0.70 million or 0.2 percent over the balance in 2013. External borrowing increased by 2.4 percent over 2013, due primarily to additional loan disbursements from the Caribbean Development Bank (CDB) for the Nevis Water Enhancement Project. Domestic debt reduced marginally over that same period,” he said. “Through instalment payments over the past two years, the balance on this debt now stands at $13.55 million at the end of September 2014 with a reduced interest rate of 6.5 percent per annum. My Government is proud Mr. President, that no holder of NIA securities was forced to take any losses on their investment,” he said. The Finance Minister noted that the NIA was committed to the debt restructuring exercise as outlined under the Standby Arrangement with the International Monetary Fund and to date, it had completed the debt restructuring exercise with all its major creditors except the St. Kitts-Nevis Anguilla National Bank. Mr. Amory explained that since his Administration came to office in January 2013, it had made great strides towards completion of the Land for Debt Swap which began with the previous Administration. “The total indebtedness of the Administration to this creditor stood at$127.97 million as at September 2014. To facilitate the restructuring process, we have transferred lands at Stock Pen to the value of $29.017 million, reducing the value of the debt outstanding to $99.94 million as at 31st October, 2014. “Mr. President, my Administration has been very cooperative with the National Bank with whom we have enjoyed a long standing relationship. We have done everything requested of us to move the process forward, yet at times, our efforts to reach a solution continue to be frustrated. It is very unfortunate, that even as we speak, your government is still unable to reach an amicable position with the Bank on the provision of credit facility to fund the day to day operations of the government,” he said. 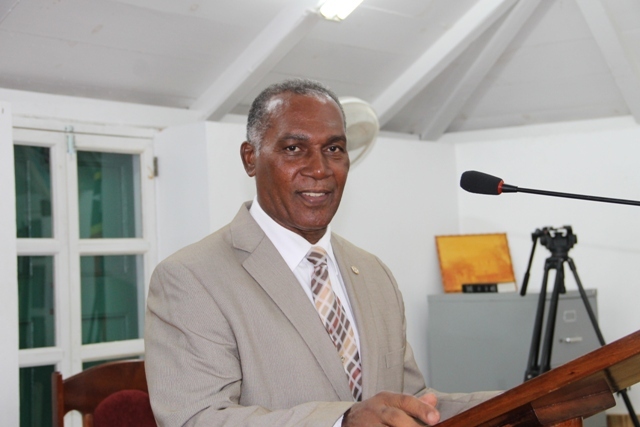 However, in the medium term, Premier Amory indicated that the Administration would continue to adopt the strict debt management strategies so as to bring about a sustainable debt situation in the island of Nevis. “These strategies include a shift from commercial loans to concessional loam funding, thereby, lowering the cost of borrowing; to cap the interest rate on all future borrowing at a rate not exceeding 7.5 percent per annum and to seek to negotiate loans with longer tenure in an effort to minimize rollover risks a d mitigate the cash flow situation,” he said.